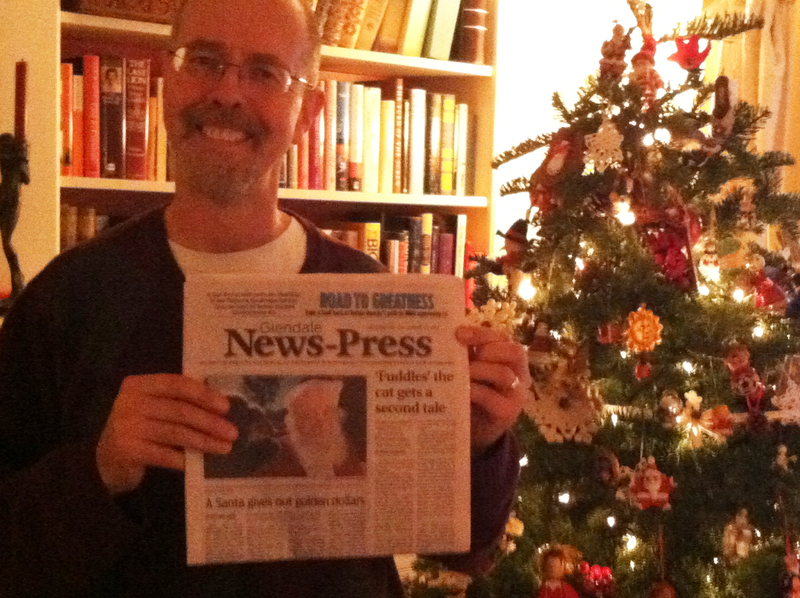 Fuddles makes the front page! 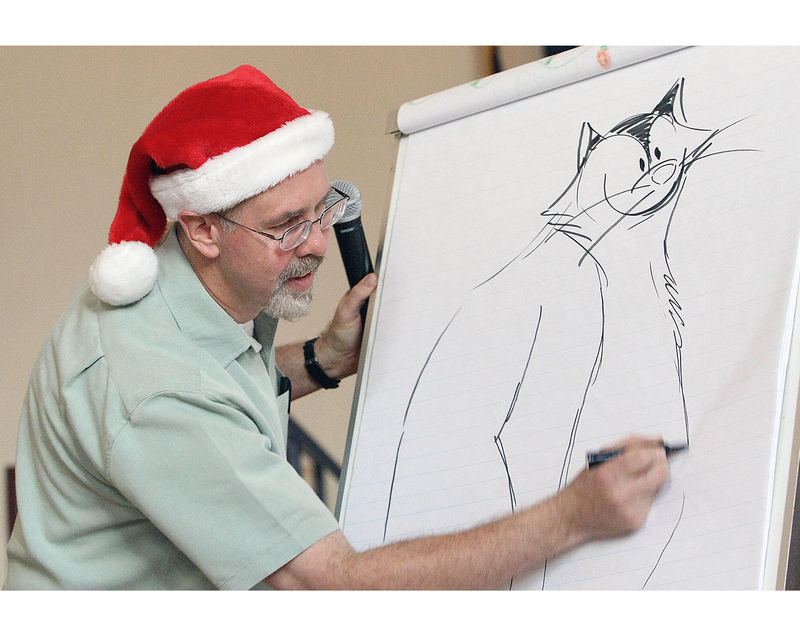 Disney animator’s adventurous cat inspires a Christmas story this time around. 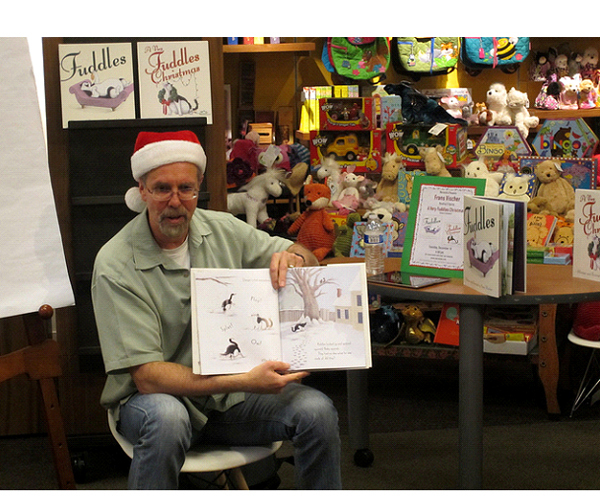 The Glendale resident and Disney animator published his second book in October, telling of the misadventures of Fuddles on Christmas Day. In the book, Fuddles wakes up as his family is preparing a holiday meal. But when Fuddles attempts to devour the family’s turkey, he’s shooed away. Soon after, he attacks the Christmas presents in the living room, and while he’s left unattended, begins to eat the family’s gingerbread house. For the past few months, Vischer has traveled to schools and bookstores up and down California as well as out of state to read the book to children and discuss animation and illustration. “Kids have just been cracking up over it,” Vischer said. 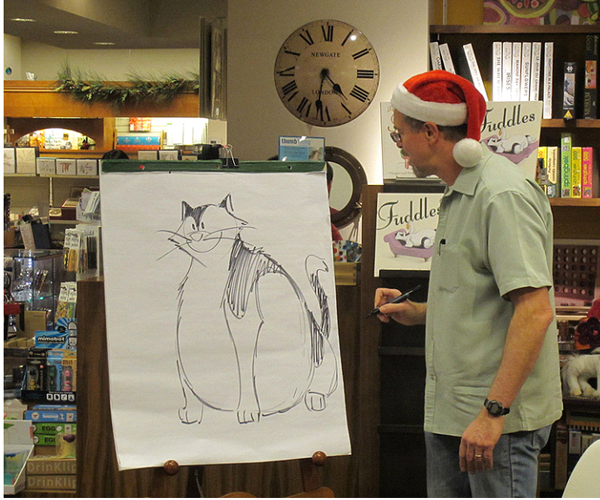 Inspired by his own pet’s antics, Vischer’s books began as sketches, with his cat — named Felix — as his muse. “All I did was just sketch up what a funny cat this guy is. It gradually just grew into a story idea,” he said. When that book was published, Felix weighed 28 pounds. He lost some of that weight largely following a veterinarian’s suggestion that he eat Science Diet wet food for kittens instead of the dry food he had loved. Vischer said Felix, now 12 years old, still gets into trouble. He’s known for opening doors and cabinets in their Glendale home, and most recently, Felix ripped open a pound of sugar that was mistakenly left inside a cabinet close to a kitchen counter. “We’ve had to move cereal from lower cabinets,” Vischer said, because he and his family walked into the kitchen one day to find Felix surrounded by a boxful of cereal he’d pried open and spilled. About two years ago, Vischer’s family welcomed Jessie, a 2-year-old German Shepard mix, into the home. The two pets must be fed separately, however, because of Felix’s healthy appetite and his interest in Jessie’s food. “I’ve caught him repeatedly staring at the dog’s food,” Vischer said. Lately, Vischer has been dreaming up sketches for a new book about a family who gets a new puppy. He’s also keeping readers informed about Felix’s real-life adventures in his WordPress blog called “Pampered Fat Cat,” in which he posts photos of Felix disappearing into an empty bag of dog food for any crumbs he might find. Other photos show him sitting contentedly in Visher’s lap in his studio. In the meantime, Vischer enjoys spending time with Felix and sharing the books that the feline inspired Vischer to write. “I feel very blessed with him, and to be able to do what I love,” Vischer said. frans and fuddles wish you all a very merry christmas and a happy new year! remember to be good to one another, and make someone happy every day, and you’ll make yourself happier too! 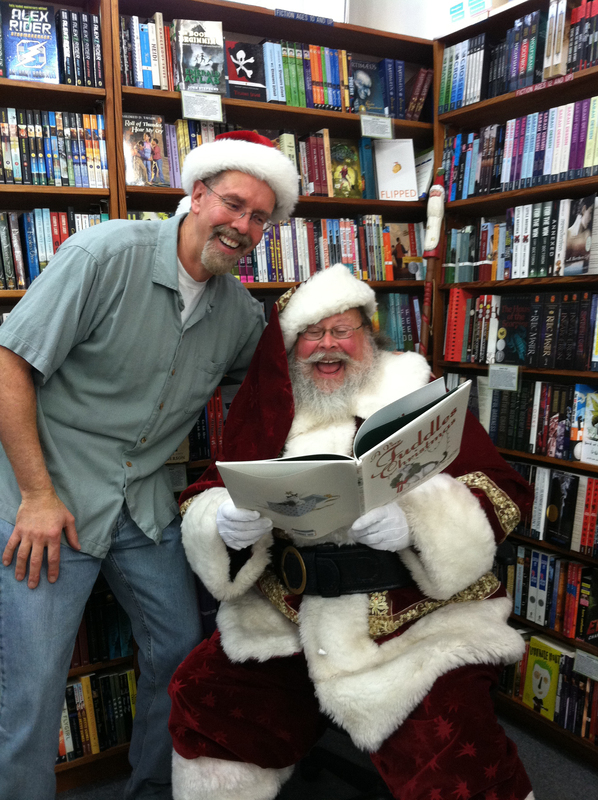 Pictures from Warwick’s Books in La Jolla! 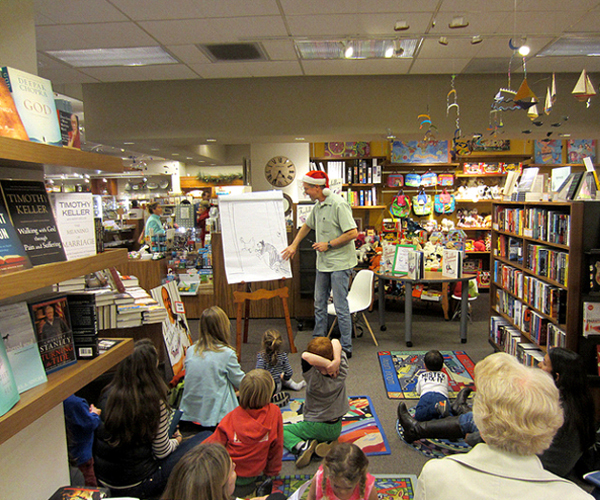 after reading a very fuddles christmas at the warwick’s bookstore, frans gave a fuddles drawing demonstration. 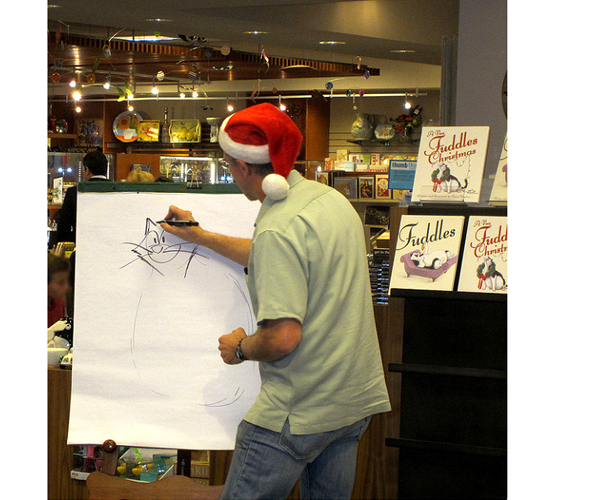 kids gave suggestions on what fuddles should do, and frans showed them step by step how i am drawn. so here i am chasing a chicken. i don’t know why i would be chasing a chicken. i’d much rather eat one, which i am about to do! i can smell chicken ravioli baking in the oven. smothered in parmazan with peas and a light tomato sauce and a few bread sticks. 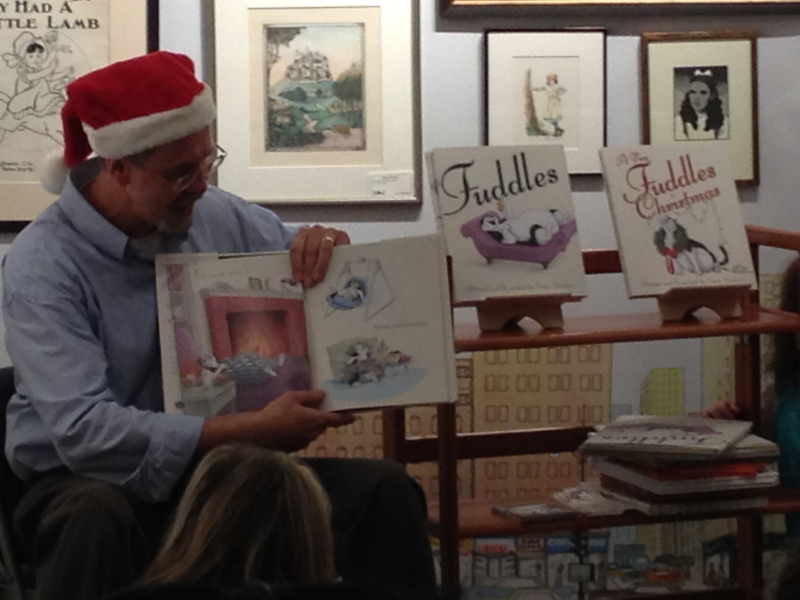 A teacher’s hilarious reading of A Very Fuddles Christmas! 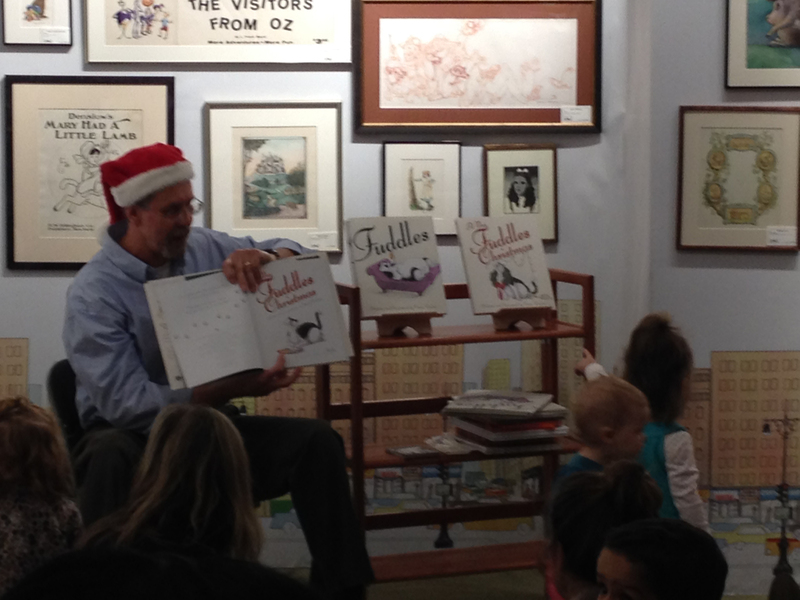 mr. ouweleen, a popular 6th grade teacher at verdugo woodlands elementary school in glendale, california, does a hilarious fuddles christmas reading. 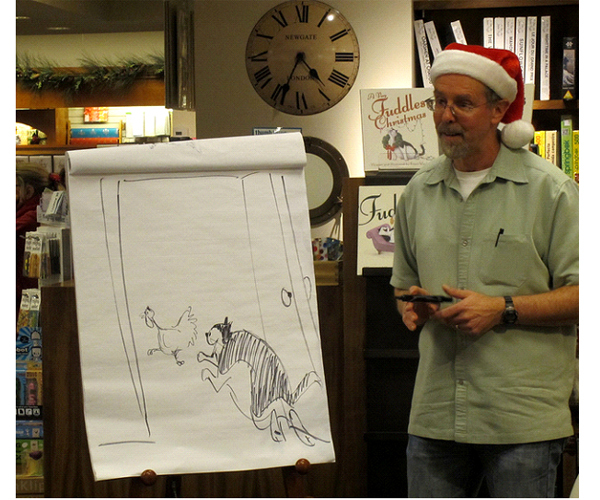 this event was at a bookfair for mark keppel elementary school at the barns & noble americana in glendale. i was invited to the event, but i’m not a fan of big crowds. i’m happy just to watch this video with a big bowl of popcorn, lounging comfortably on my pillow, watching mr ouweleen prance and dance and skip around. 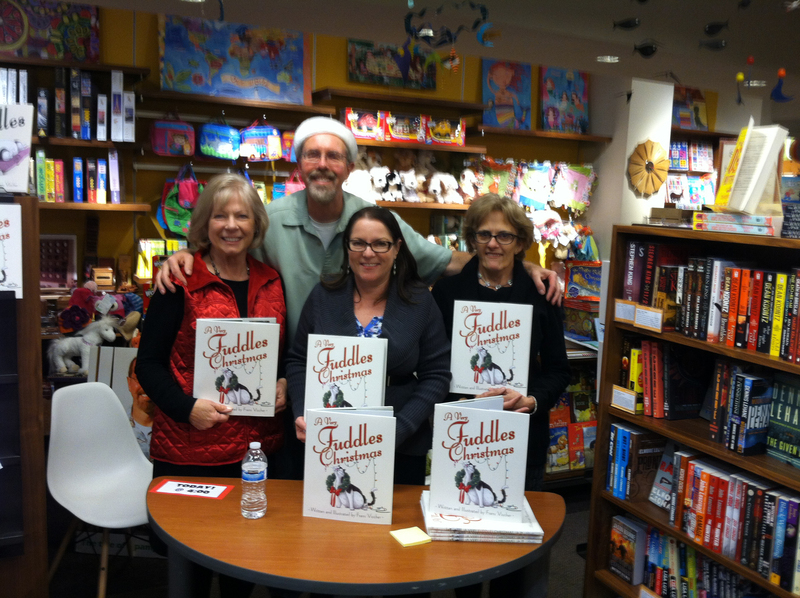 Fuddles book-signing at Warwick’s in Ja Lolla! frans went to san diego this week and visited kavod elementary school and st. andrew’s episcopal school and stella maris academy and yellow book road bookstore and warwick’s books gifts and stationary. everybody clamored for me because i am the real star, but i stayed home because being away from my litter box makes me cranky. so i stayed home with the family and i had a most yummy meal- lamb stew! mom always makes it with chopped fresh parsley and dry bread crumbs and olive oil and chopped garlic and a beaten egg. i stuffed myself so much that i felt like a beaten cat! 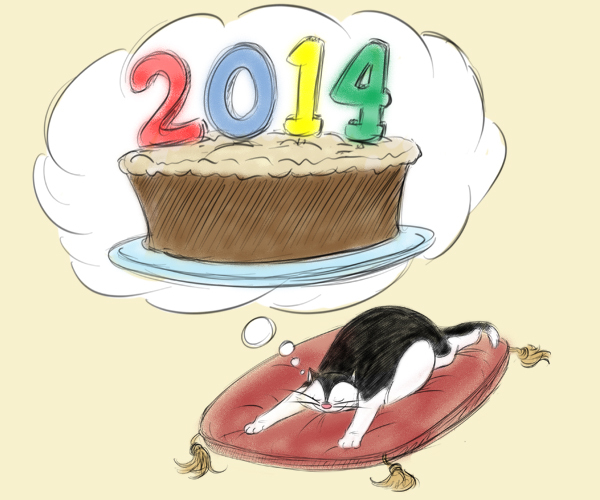 i took a nice long catnap after that meal! yay! i’m on tv! in los angeles anyway. i’ll be on the abc family channel and on nickelodeon on tuesday to sunday! so look for me there! i’m going to have a big bowl of popcorn and hot chocolate with whip cream and maybe a slice of pumpkin pie and some candy canes and a comfy blanky and i’m camping out on my pillow on the couch by a warm fire to watch! A visit to New York! yay! 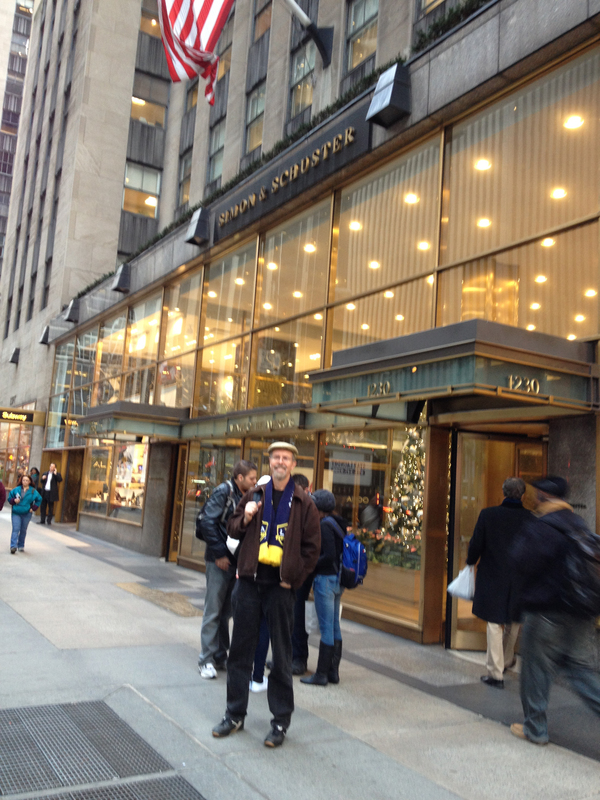 frans and his wife went to new york to visit his publisher, simon and schuster. they got to meet all the people that helped frans make the fuddles books. 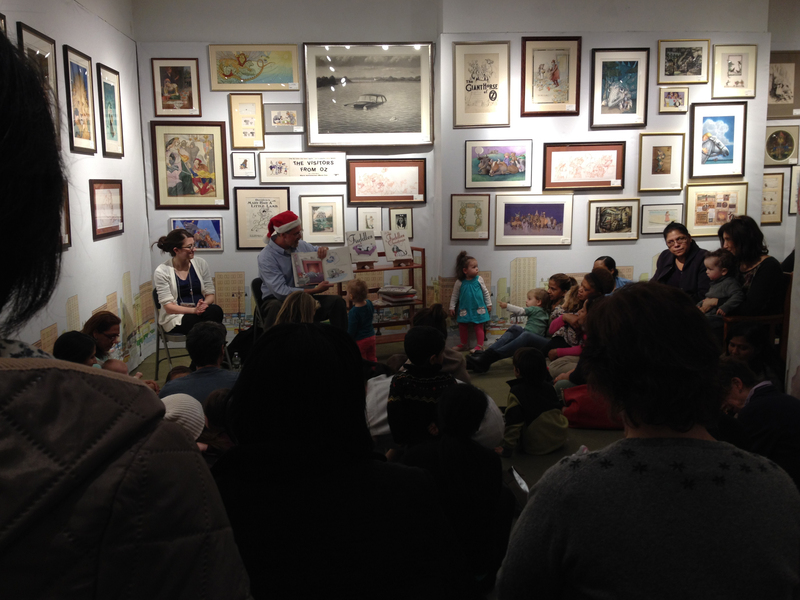 then he did a fun book-signing at books of wonder, a beautiful bookstore with lots of great books and artwork, and a bunch of giggling kids! 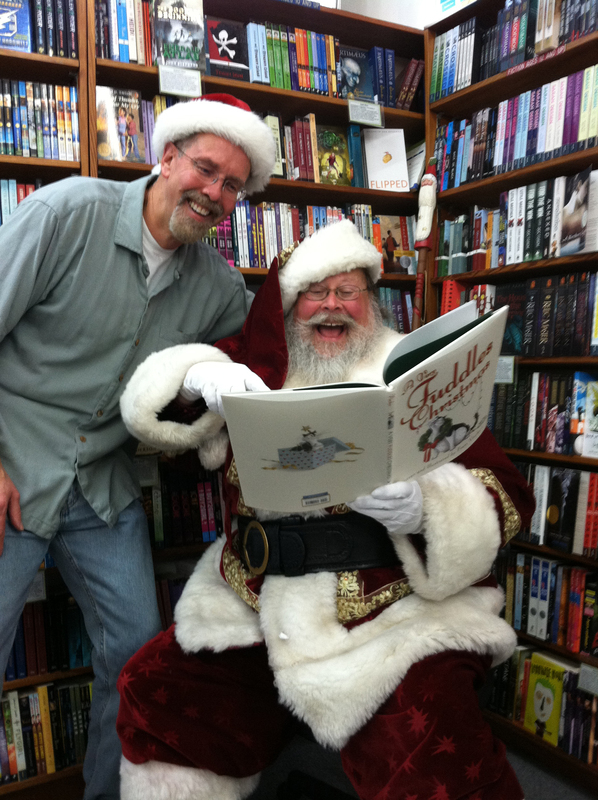 frans was at once upon a time bookstore in montrose, california on saturday to support his local businesses. 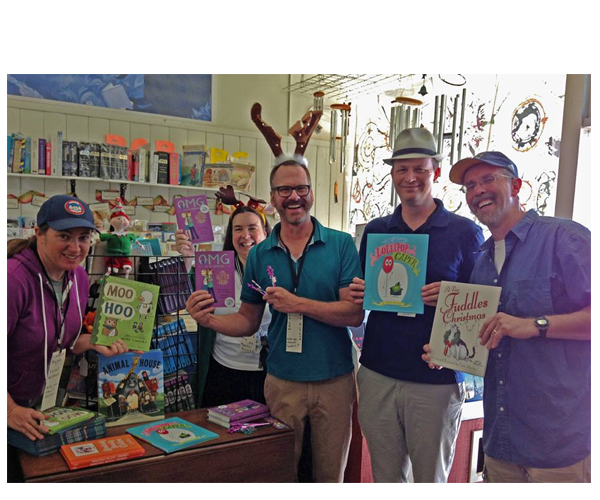 with frans in this picture are candace ryan, author of moo hoo, dan krall, the author of the great lollipop caper; and barbara brauner and james iver mattson, authors of oh my godmother, the glitter trap. they had a fun afternoon chatting with customers and signing their books. there wasn’t much food there, so i stayed home and had a double bratwurst sandwich with sauerkraut and onions and lots of mustard. and then i had a nice catnap!